Work from Home-You should or should not. Over the years work from Home jobs are increasing, to cater to climatic conditions, locations and health the organizations are opting for work from home options because the important criteria is work and these organizations don’t want to limit themselves. To work from home is a change in lifestyle which is adopted by many companies day by day. You can do your job where ever and whenever you want. That is the biggest test for yourself, how well you perform when you don’t have any one watching you, it develops discipline in yourself and you are not obliged to work for some one, that is the time you work for your self. You enjoy your work. A survey summarized in Microsoft whitepaper work without walls indicates the benefits of working from home.You can hire people with out any geographic limitation. It helps you to hire the best and relocate them to the places near to your clients and not to your office premises. There are two types of group. Group 1 thinks “People who work from home are not actually working, they think one person is sitting in his cube witnessing his presence is actually working”. Group 2 thinks ” Giving all freedom to employees will make them happier and more productive”. 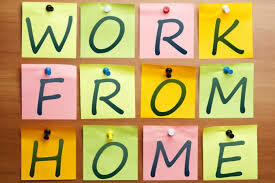 Work from home is not a benefit only for a employee but it can benefit employer as well. Recent studies have confessed that working from home increases productivity and decreases stress which you actually face when you sit in office. Whatever may be the reason the person sitting in the office is always affected by office politics and the one sitting across is only working in a healthy environment.The organizations who actually support work from home save lot of money in long run.The work is all about technology. You just need to be in constant touch with your employees and direct manager so that there are no loop holes. We are blessed to live in a world of technology like Skype, video chat, Lync where your presence can be felt, meetings can be attended. If you all remember the recent incident of Elphinstone Bridge the day is not far when we have to look for options wherein you have to travel less everyday. Thousand of people fight everyday just to reach office and after that they are tired. Working from home will give them relief from this mundane activity and will turn increase their motivation.It also helps to maintain the personal and professional life , which in turn makes you more jovial and responsible because you are not frustrated to lose any of your time. You can cater to both the needs which gives you inner peace. Not all jobs are suitable for work from Home. It also depends on the person itself how well he performs. Just as every coin has two sides it too have disadvantages. People usually say they just miss professional life and are bored at home. For that one can maintain balance between the two. By going office biweekly or attending seminars or meetings. If people establish goals, rhythms of communications and metrics, than they would actually know whatever someone was productive or not , regardless of judging an employee on the basis of work from Home. Every strategy has its pros and cons but that does not mean to obsolete. We can adapt and always work on imperfections. We all work for better life and future so why don’t work in a ambiance which we love and maximize profits for our organizations.In the current scenario where there are lot of start ups but they donot have office you have to anyways work from home and attend meetings and calls. To have bricks and mortars office when you talk about business but these startups are eradicating the old conventional outlook and thus are saving huge money. The money saved is used more efficiently in terms of product development. fuebdsstq,Thanks for ones marvelous posting! I actually enjoyed reading it, you will be a great author.I will always bookmark your blog and will aohrdocfa,come back from now on. I want to encourage that you continue your great writing, have a nice afternoon! mprxtre,Thanks for sharing such an amazing blog. I am so happy found this informative blog.